I used the simple sketch from Sketch for you to try. 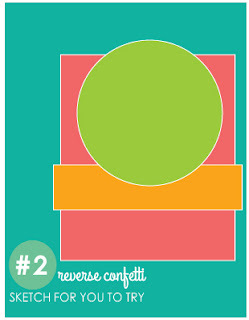 And using polka dots as my designer paper and embossing folder allowed me to use the CAS-ual Fridays sketch! We have been raspberry picking this week. 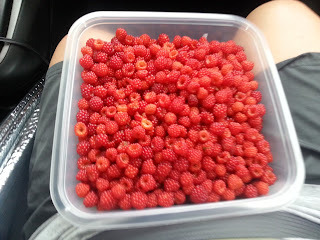 Because of the humidity I can only handle 2 hours at a time, but 2 hours the first day we picked 5 quarts of berries. Its the cleaning of the berries that I wish I could NOT do... picking everything off by hand, so they do not mash is alittle bit tiring... oh well..
Great card, that image is too funny! The raspberries look pretty yummy! 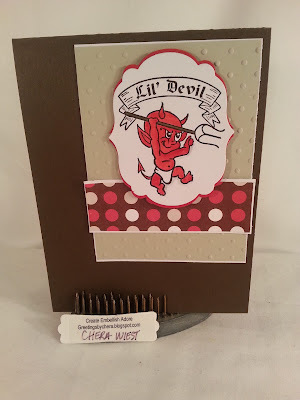 What a devilishly cute card! Thanks for playing SFYTT! Great pairing of a devil with polka dots ... what a fun contrast! And those berries look delish. So glad you joined the CAS-ual Fridays Challenge! Very fun card! Thanks so much for playing along with us over at the CAS-ual Fridays Challenge blog!